How do my clients report their pain and adherence on PhysiApp? Your patient will complete their rehab program using PhysiApp. PhysiApp is available on iOS, Android and as a web version. At the bottom of this page are various help articles available to your clients (and you) regarding PhysiApp. Once your patient has succesfully accessed their program, they will be able to view their exercises videos individually. 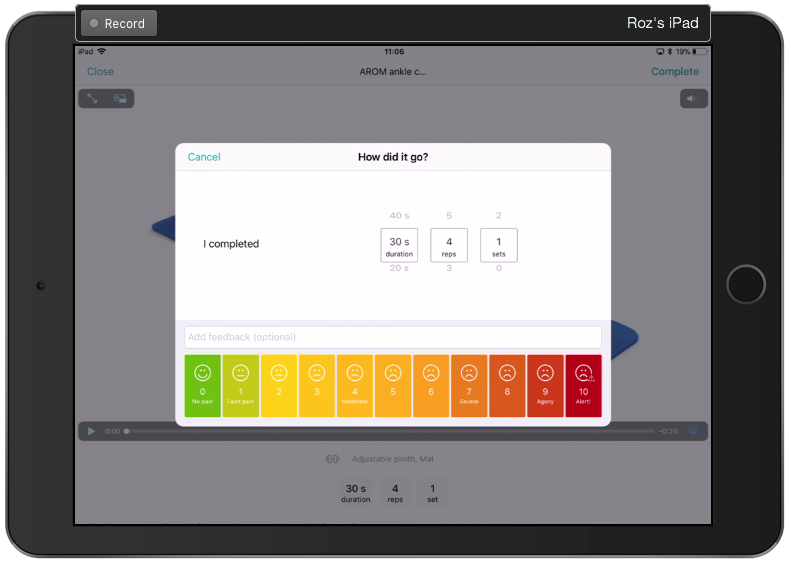 After each exercise, if you have selected to track pain and adherence, your client will tap "Complete" in the top right corner, then see the following window pop up. After entering the true parameters they completed, and the pain level they experienced for this exercise, they will be taken on to the next video. After some time, your client may of memorised their program so there is no need for them to watch each video individually. They can "quick report" back their results by tapping the bar at the top of their main program view screen. This allows them to scroll through the exercises displayed on one page and enter their parameters and pain levels using the rollers and sliders. Tap "Complete" in the top right corner to feed all of this information back in one go. What is a web browser and how can I access one? What to patients need to use to get PhysiApp? Where do they enter their access code? How do I view my client's pain and adherence? How do I turn client pain and adherence on/off?